With trauma and emergency services, where you seek treatment really matters. That’s because with major trauma, every second counts. We’re talking about injuries from motor vehicle crashes, falls from height or down stairs, burns, and combined or multisystem injuries. For these you need an expert team with the experience and technology to make a quick and correct diagnosis. You need dedicated operating rooms with trauma surgeons available 24/7. You need unlimited access to a blood supply and immediate access to trauma specialists and emergency physicians, as well as experts from a wide variety of medical specialties. And you need it fast — every day of the year, every hour of the night. With minor emergencies, you need the expertise, sophisticated processes and gold standard procedures in place to keep minor things minor so you can get back to your life as quickly as possible without complications. For both, there’s Stony Brook Medicine. 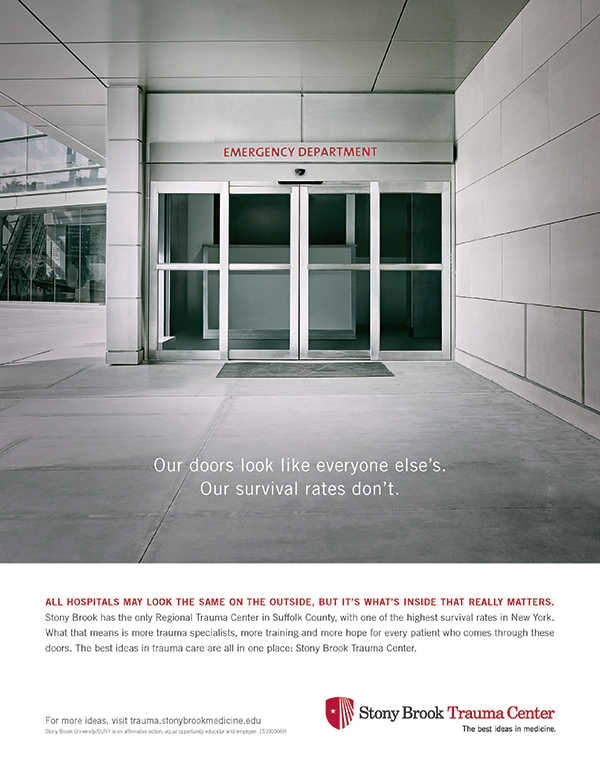 Not only have we been Suffolk County’s only Level 1 Trauma Center for the past 20 years – meaning that we care for the most critical patients – but recent statistics show that Stony Brook is one of two hospitals in New York with the best survival rates for seriously injured patients among all the trauma centers in the state. This includes Manhattan and all of Long Island. If you are sick or injured, Stony Brook is where you want to be. Stony Brook is what’s known as a regional trauma center. This means that it has been designated by New York State to handle the most severe injuries and most complex cases. As the county’s only Level I Trauma Center, Stony Brook provides a level of care beyond the capabilities of the emergency rooms at local hospitals. In fact, patients who arrive at community hospitals with serious illness or injury are often transported to Stony Brook. What does the Level I designation mean? Although the criteria differ by state, the trauma center ranking system (Level I, II, III, IV or V) refers to the kinds of resources and the standard of care available, as well as the ability to handle a certain volume of severely injured patients. Level I is the highest designation, indicating that the most advanced care is available. Level I facilities such as Stony Brook are typically part of a comprehensive tertiary care facility that serves an entire region. They are able to provide 24-hour, in-house (as opposed to on-call) coverage by trauma surgeons, as well as prompt availability of care in specialties such as orthopaedic surgery, neurosurgery, anesthesiology, emergency medicine, radiology, internal medicine, plastic surgery, oral and maxillofacial, pediatrics and critical care. Level I trauma centers also take a leadership role in prevention, public education and continuing education of trauma team members, along with participating in research and quality assessment initiatives.